Join the tour Jewish Heritage in the Baltics as it follows the history of the Jewish people visiting historical memorials that were left behind. This tour enables us to experience the impact of Jewish life throughout the centuries in the Baltics. On arrival in Vilnius, the capital of Lithuania, you will be greeted by your Tour Director and transferred to your luxurious hotel in the heart of the city. In the evening, enjoy a Welcome Dinner. Overnight in Vilnius at Stikliai Hotel. Breakfast at the hotel. Let’s discover a place once called “the Jerusalem of Lithuania”, beginning the tour at the Cathedral Square, continue via the President’s Palace and Vilnius University. Visiting the Great Vilna Synagogue, we pay our respect at the Vilna Gaon’s grave in the Vilna cemetery (many come here to ask for a blessing). Next, explore the beautiful Vilnius Jewish Museum dedicated to the historical and cultural heritage of Lithuanian Jewry, and the Art Gallery housing the largest archive on Lithuanian artists in the 20th – 21th centuries. In the evening, let the joy of Shabbat lift your soul as you enjoy Friday Night Dinner. As is often said, “more than the Jewish people have kept the Sabbath, the Sabbath has kept the Jewish people.” Yes, it has kept them strong, united, and filled with an eternal sense of peace – Shabbat Shalom. Breakfast at the hotel. Today is a day of rest, and your morning is at leisure to stroll around the city, or perhaps join in local Shabbat services. In the afternoon, embark on a walking tour through Vilna’s charming, cobble-stoned Old Town, where you will also see the old Jewish Quarter, with its narrow streets and courtyards. Breakfast at the hotel. Begin this day with a somber visit to the Ponar Forest and Memorial outside of Vilnius. Amidst the delicate rustling of the poplar leaves, feel the presence of thousands of Jews, shot in the early days of the war – but (as proved by your visit) never forgotten. Later, journey to Kaunas (or Kovno), second city of Jewish Lithuania. En route, stop at Trakai for a spectacular view of the ancient castle. Continue to Kovno, where Lunch is served. In the afternoon, tour Kovno, including the notorious Ninth Fort, where 30,000 Jews were murdered. 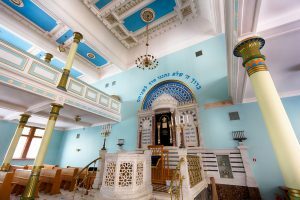 Visit the former Kovno Ghetto and Monument, as well as the splendid Chorale Synagogue. Next, the Sugihara House adds a touch of altruism to the picture – Sugihara was a Japanese diplomat who (like a Shogun Schindler) bravely saved hundreds of Jews. En route to the hotel, see the Laisves Aleya, Kovno’s broad, elegant boulevard of shops. Checking in at the hotel. Overnight in Kaunas at Daugirdas Hotel. Breakfast at the hotel. Visit the environs of Kovno. First stop is Kedainiai, tied with the prominent Radziwill family who were nobles of Grand Duchy of Lithuania. Continue to Siauliai (Shavel), once a prominent Jewish town, which features a former ghetto and museum. Lunch is served during the touring. The next stop is Joniskis — a small town, once a shtetl, to visit two synagogues. Continue on and cross the Latvian border. Next, visit the exquisite Rundale Palace, a Baroque masterpiece that some admirers compare to Versailles, and elaborate gardens. Continue to Riga, the capital of Latvia. On arrival, check into your hotel, located in the center of town. Overnight in Riga at Gallery Park Hotel. Breakfast at the hotel. This morning, embark on a full day tour of Jewish Riga, including the Jewish Quarter, “Alt-Neu Shul” (Old-New Synagogue), and moving Memorial to the former Great Synagogue, which burned to the ground. See the wall honoring the Righteous among the Nations. Learn the fascinating story of Jannis Lipke, a heroic Latvian who saved many Jewish people. Comforted by this tale of heroism, pay respects at the Rumbula and the Bikernieki Memorial, honoring the Jews of Latvia, Germany, and Czechoslovakia. Afterwards, see a typical Latvian Jewish school, this one founded in the 1800s by Rabbi Max Lilienthal. Visit a museum exhibit on the history of Jews in this part of the world. Next, a visit to Riga’s Jewish Community Center, splendidly housed in a former theater. Lunch. In the afternoon, pay to visit the fascinating and well-tended Jewish cemetery of Riga. Later, return to the city and see some of its architectural highlights. Stop by the one of the few Art Nouveau synagogues in the world. Breakfast at the hotel. This morning, visit the small but informative Jewish Documentation Center, part of a museum which exhibits Jewish Life from the 18th Century to the present. This Center vividly illustrates how the Jews played a major role among intellectual Latvian society, and how their magnificent community was nonetheless cruelly destroyed during the Holocaust. The newest historic section of this museum illustrates how Jewish Life in Latvia was reborn after its independence. Next, depart Riga by coach and drive north and enter the Republic of Estonia. Lunch served en route. Stop at the resort town of Parnu, beautifully situated on the shores of the Baltic. Continue to Tallinn and check in at the hotel. Overnight in Tallinn at Telegraaf Hotel. Breakfast at the hotel. This morning, enjoy a tour of the charming city of Tallinn Estonia, rated by several travel magazines as one of Europe’s “best-kept secrets”, and placed on UNESCO’s list of World Heritage sites. Drive to the Old Town on top of a hill, to find breathtaking views of the tiled roofs and colorful houses below. Stroll the beautifully preserved Medieval streets and become a part of Tallinn’s thousand year-old history. Walk past the impressive Alexander Nevski Cathedral to the Town Hall Square. Continue to the intimate Tallinn Jewish Center and synagogue. Later, enter the lively Lower Town. Time at leisure to browse this quaint town on your own. Farewell Dinner. Tips, except to tour director, guides, and drivers. No visa is required for travel to the Baltic countries. Always make sure your passport is valid for at least 6 months after the tour ends.